What You Can Recover After a Dog Bite on a WI Sidewalk | Hupy and Abraham, S.C.
My neighbor’s dog escaped from its yard and bit me while I was walking on the sidewalk. Can I recover damages? Yes, you may be able to recover damages for your dog bite injuries given the circumstances that you describe in your question if you act quickly and before the Wisconsin statute of limitations for dog bite accidents expires. Escapes from a fenced-in yard. Escapes from a yard with an electric fence. Breaks away from a dog run or lead. Breaks way from a leash. It doesn’t matter if the dog owner took reasonable steps to prevent the dog from escaping. Since Wisconsin’s dog bite law is one of strict liability and not negligence, the reasonable efforts of the dog owner are irrelevant. Instead, you need to prove that a specific person owns the dog that hurt you. If you have been bitten on a sidewalk by a dog that escaped its yard, then Wisconsin law allows you to recover for the full amount of your injury. This may include past, current, and future lost income, medical expenses, out-of-pocket costs, and compensation for physical pain and emotional suffering. In some situations, Wisconsin law allows you to recover even more than that. If you can prove that the dog owner knew or was notified that the dog had previously hurt a person, a domestic animal, or property, then you may be able to recover double damages for your injuries. However, in order to recover any damages for your injuries, you are going to have to advocate for your full and fair recovery. This may include negotiating with the insurance company or starting a lawsuit. 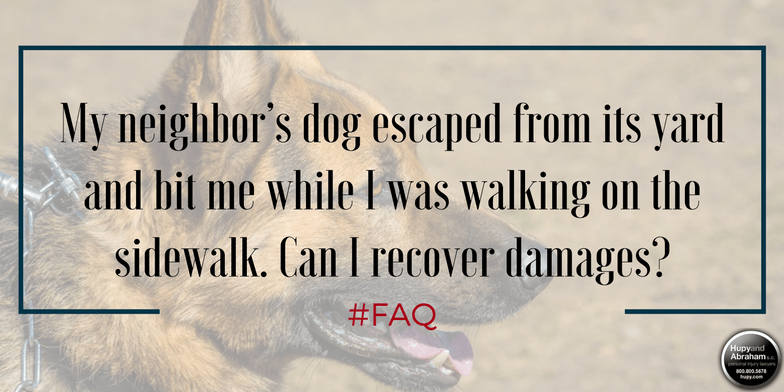 For more information on how to protect your right to a fair recovery, please download our FREE dog bite brochure and start a live chat with us any time.